So I've been attempting lots of posts over here, but I'm getting stuck because this Mean Kate on my shoulder is like: "You know you already wrote about this, right?" and then Nice Kate on my other shoulder is like: "Awwww. Be nice. But she's right." I thought I would wait to do serious remodel pics until things were done, and I could do these snazzy big reveals or something, but things are...a long way from done, and I'm sitting at home, antsy, excluded, picking raisins out of our wicker benches while Jacob spends his spare time working on a dream of ours. So. I've decided you all get to come along for the ride. This is the Remodel from my Seat. The Pinterest Seat. Like virtually every ranch house in Houston, our's is a wide, single story rectangle. (Yay architecture!) 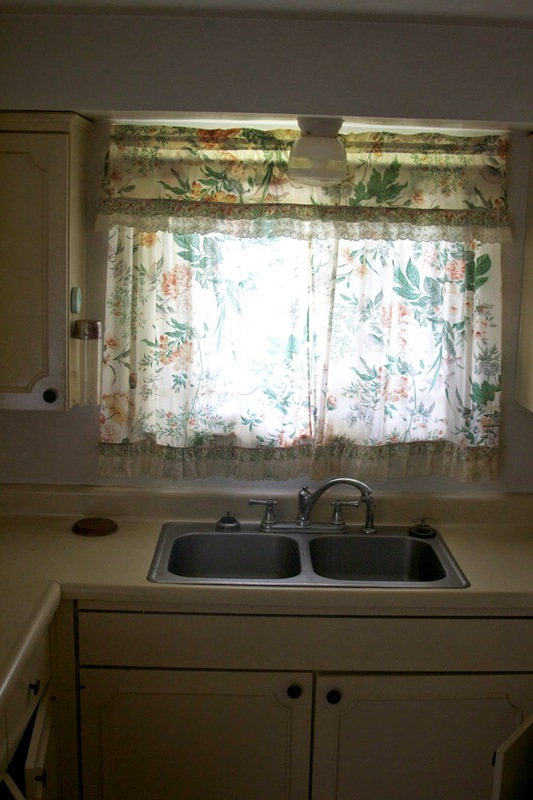 The kitchen in the house was tucked back in a corner. But really it's OK. It's like a Tabula Rasa with a Gas Hook Up. So now we're left to make all these design decisions. And that mostly means Jacob and me arguing and my brothers attempting to keep the peace. But here are some of our/my pinspired photos. We're going to go mostly white. The cabinetry will be white. The backsplash will be subway. I'm thinking our subway grout will be a light gray. I like a little more definition over straight white grout, but I prefer it faint. We will have some open shelving. We'll probably use some old oak shelving that Jacob scored when doing work on a century old house in Galveston. We will also put in an island. I grew up with a big island in my parents' kitchen and I'm very pro island if you have the floor space. We barely have the floor space, but we're gonna make it happen. Right now we have a bit of battle going on between Quartz and Butcher Block. The biggest talking points are price and durability. I love the look of butcher block, but I'm a little nervous about upkeep especially since we might very well lease this house out someday. The quartz is more expensive but will stay looking nice without us ever having to oil it or sand it down. We're also considering a blend. The island in butcher block perhaps? Change it up and have a segment of butcher block countertop right next to the stove? I would love to hear your countertop thoughts. As a renter myself, I say go with the more durable quartz! Worth it in the long run. I like the idea of butcher block on the island though! We just replaced our counter tops - had the old white laminate from 20 years ago. We just went with granite that has a polymer mixed in, so it's super durable. If it was me, I would go with the quartz. Butcher block is hard to keep clean and nice, and that whole "bacteria down in the wood " thing isn't good - if you get scratches and scrapes in it. We kept our cabinet boxes but put new doors on as well. It looks brand new! Can't wait to see your in-progress pictures! Ah, I love the idea of an island with butcher block top. But renters won't care for the counters as much as a homeowner would. I'm so excited about following this progress! I love the idea of the butcher block island, but I say do quartz unless you can do the butcher block so cheaply you don't mind redoing it in a few years if necessary. Also, I saw an episode of the Rehab Addict once on an airplane and she salvaged old doors for kitchen counters. I don't know anything about that except that I saw it once on TV, the host said they'd be durable, it was cheap, and it looked cool. Again-- again! I am SO EXCITED you're blogging your house projects. We are looking very seriously at a house with black cabinets in the kitchen and I'm debating painting them white or gray. The counter and back splash are black granite. I love butcher block for the island. Go with the quartz for the counters. My neighbor did that and it looks so good! 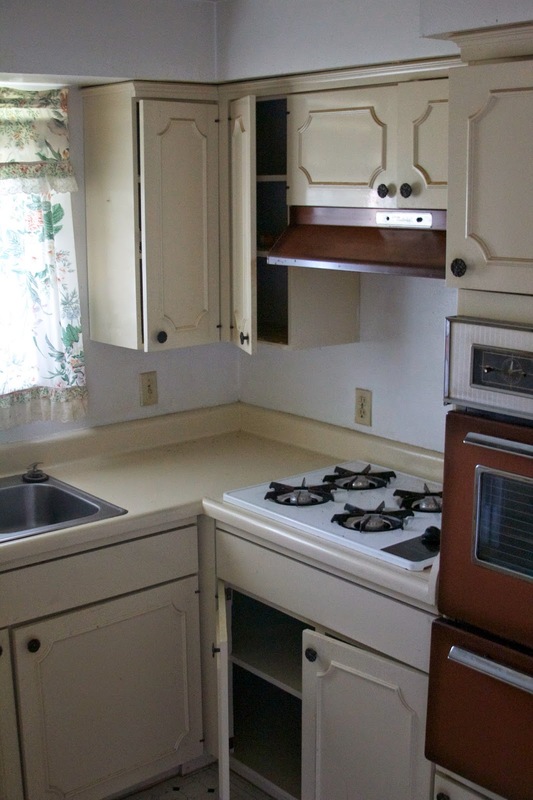 I would definitely prefer lighter cabinets to black cabinets...but what a repainting job that will be. My parents have granite counter tops with a butcher block island. It looks cool but the butcher block is starting to really show some wear since they cut food on it. We would definitely cut food on it. I'd be interested to know if they can "freshen it up" without totally refinishing it. Love white kitchens! And open shelving! and islands! And I have no opinion on counter tops but I very much see the dilemma. I'm excited you'll be updating us on the house in real time - so great! We've got quartz and have been really happy with it. Zero maintenance, the concerted efforts of many children have yet to stain or scratch it. And the island is where we do crafts and science experiments. What happens if paint or food coloring gets on a butcher block countertop? I don't know...I suppose if it's thick enough you could just sand it down? Not sure. It's so pretty and people use it. It must be slightly more practical than it seems. Girl believe in yourself.. I just remodeled and I did white shaker cabinets, I found beautiful chrome polished pulls like the ones in the first picture on discount... I did the white subway tile with the white grout... and a white farmers sink and I did a white counter... This was the only part that was tough.. My husband thought black... 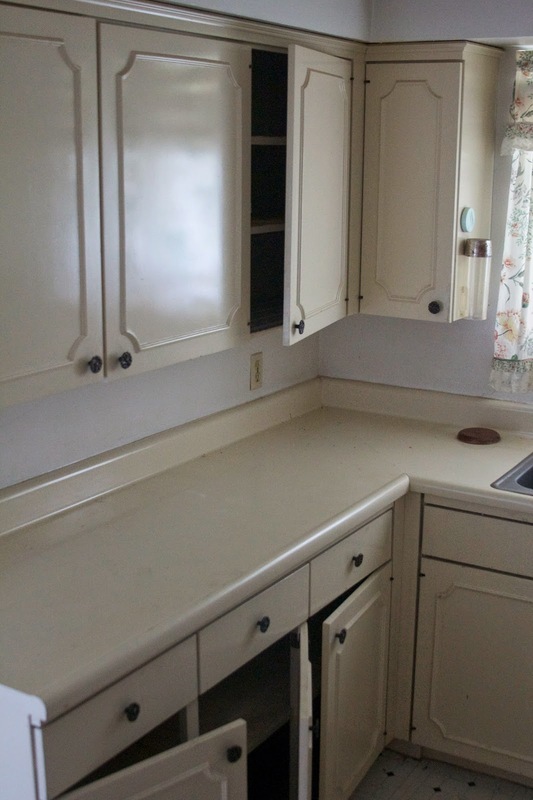 I think it is tough to find a white counter that looks not cheesy. So I almost did butcher block... We did go with a white quartz because it will last and it's impermeable etc.. I have friends with the butcher block... They said it looks good but they are nazis about keeping it clean otherwise it gets slimy... But it is budget friendly so you gotta make choices.. You could always do butcher block for a couple of years and if it gets nasty just replace it with something you've budgeted for like Marble or a quartz that looks like marble. 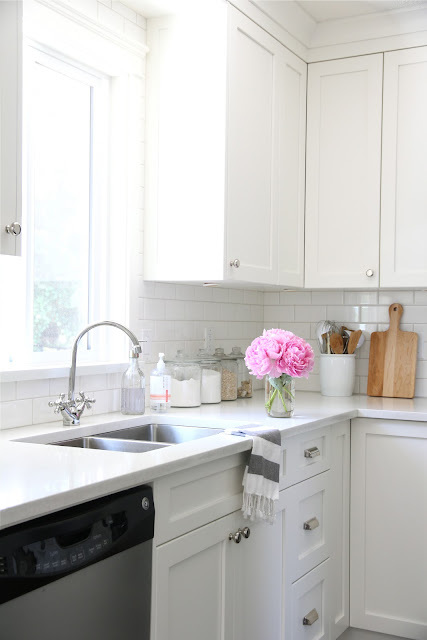 I almost wish I had a blog so I could link to my kitchen before and after... our old kitchens look identical... Good luck..
You are describing my dream kitchen. My Dream. Kitchen. Subway tiles, sigh+faint. I'm so jealous you're on this journey, though I'm sure there is some stress associated. Fun stress I hope? Loving your ideas! If you do butcher block, I'd just do it on the island. I think it would look fantastic, but have some reservations about the durability, esp with renters? I mean, we were good renters, but I know there's a lot of people who aren't, and it's always different if you know it's not up to you to take care of it in the end, you know? Oh man, I cannot wait to see the final pics. 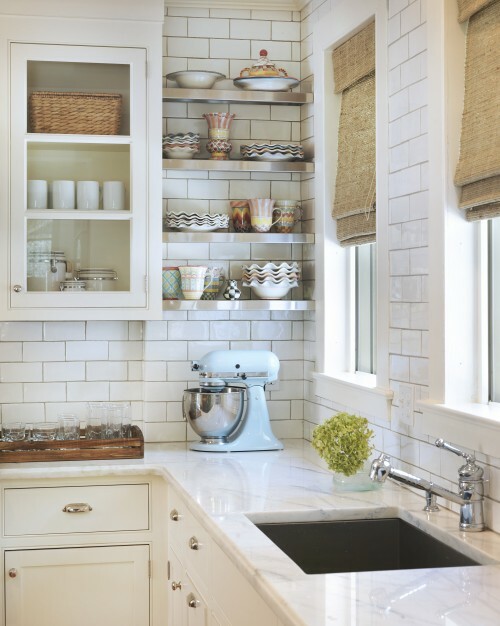 I love the subway tile and the open cabinets. We have granite so I don't have much to tell you other than if you do with quartz, go with a color that doesn't show everything. 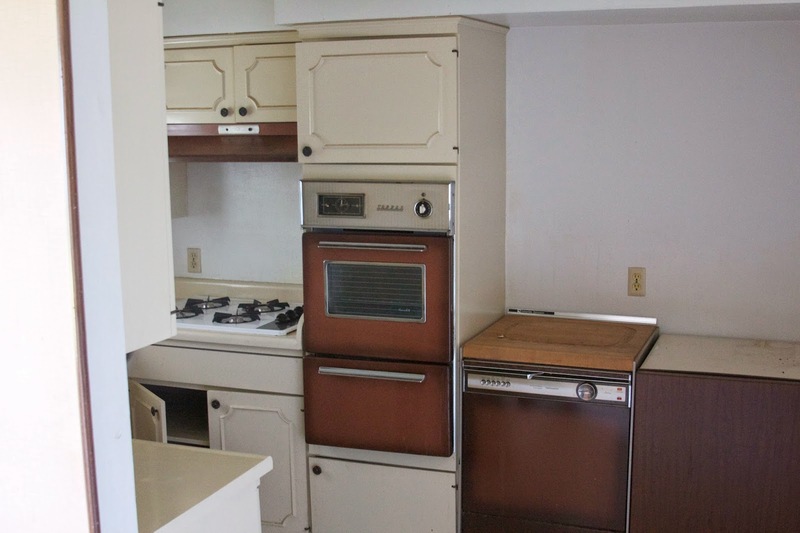 We did white cabinets and black tops - WHAT WERE WE THINKING? So I lived in a group house with butcher block countertops. It was fairly sturdy and was structurally fine, but it stopped looking all Pinteresty approximately 2 seconds after someone cut that first apple directly on the counter. I'd vote for Quartz. This is great! We're also remodeling our house we bought at the beginning of the summer. We're doing it longer term and while we live in it, with two little kids kicking around too. I'm so excited to see what you do! And I need lots of ideas too. 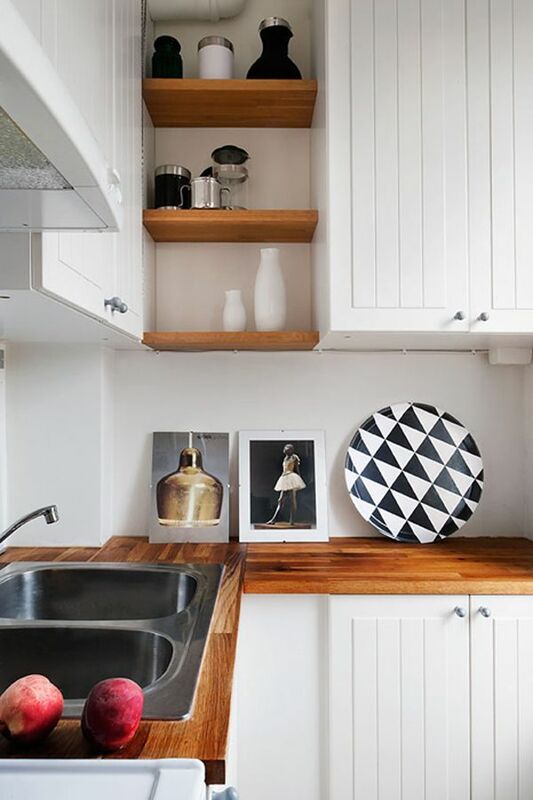 i LOVE photo #2 - those white cabinets and the subway tile give me heart eyes. 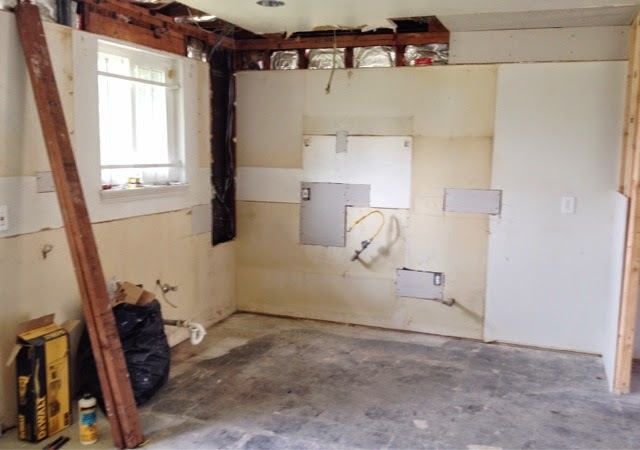 we are remodeling our kitchen too [next year...] and are planning on those tiles with grey cabinets. also i vote butcher block for the counters! stoked to see your progress! Have you made a decision yet? 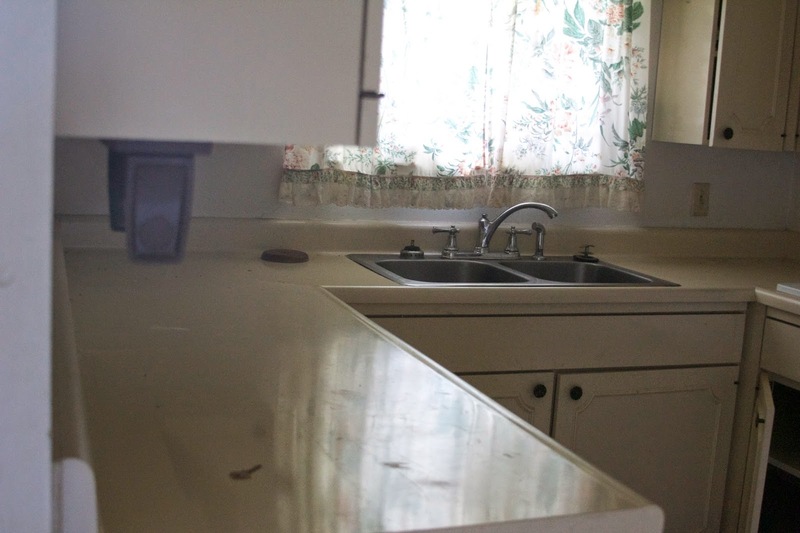 Have you thought about concrete counter tops? Jeremy is obsessed with them and is trying to convince me to do them when we remodel our kitchen.